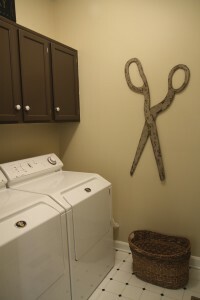 So what does your laundry room look like? I know it’s supposed to be a functional space, but I really wanted mine to be a bit more, let’s say, pretty vs. just functional. It sits right off my kitchen and even though the door is usually closed, if it’s not I wanted it to be at least pleasant to look at. My husband thinks I’m a bit nuts with this one, but I am who I am. Before I had more of this look. Again, functional, in a messy kind of way, but not really what I had in mind. I would kill to have that much space though! 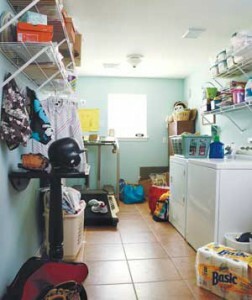 I also didn’t want to spend a great deal of money on the laundry room. I figured I must enough random stuff around the house to take care of my small space. Of course, I had to do a bit of shopping, but not too much. Now here’s the photo disclaimer, this room is tiny and it was really hard to get any decent photos. So bear with me, I think you still get the idea! The wall color is Believable Buff by Sherwin Williams. I’m not so sure about it yet, may end up changing it to something brighter. The cabinets are Chocolate by Restoration Hardware. 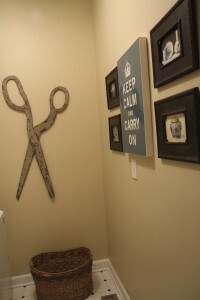 I had all paint mixed in Behr by Home Depot, which I will almost always do, because E works there! Love my scissors! They came from the Foundary and were only $35! Have you checked out the Foundary? I’ve gotten a few things there. Great deals and good quality! 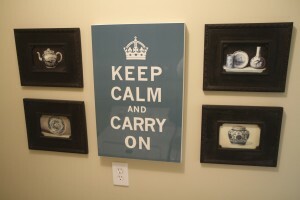 Now I know that some of you may be really tired of the “keep calm and carry on” mantra, but it really does work for me. It’s also the same color as the kitchen, so it worked well in here. I got it for $20 at Home Goods. The oil paintings are from my travels overseas. Always wanted to use them. Great memories, they make me smile. 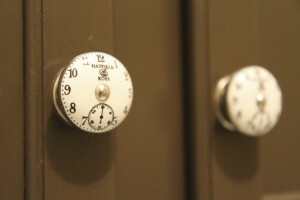 Last but not least, knobs from Anthropologie, where else? So, that’s it! What do you think? Simple changes, a little paint, a few accessories go a long way! Have a great weekend!